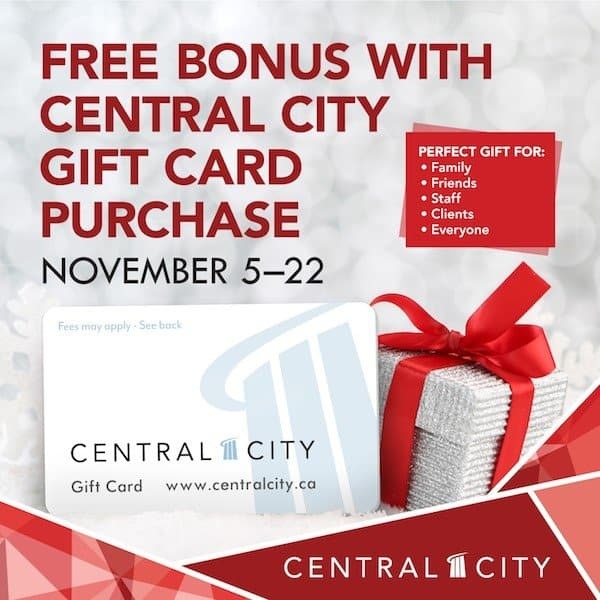 From November 5 to 22, purchase $500+ in Central City Gift Cards and receive a free bonus $50 Central City Gift Card! Central City Gift Cards are redeemable at most of the centre’s 140 stores and services and are available in denominations from $5 to $500. Central City Gift Cards are the perfect gift for family, friends, staff, clients, or anyone on your gift-giving list this holiday season. Visit Guest Services (located on the upper level of the shopping centre) or call Guest Services at 604.587.7773 for more details. *One gift per person while quantities last. Offer cannot be combined with other promotions. Gift Card purchases must be made in one transaction during the period November 5 to 22, 2018.